An interdisciplinary team of Swiss and Dutch archaeologists today announced the rediscovery of a 29-meter-long Luwian hieroglyphic inscription that describes the events at the end of the Bronze Age in the Eastern Mediterranean. One of the greatest puzzles of Mediterranean archeology can thus be plausibly solved. The 35-cm tall limestone frieze was found back in 1878 in the village of Beyköy, approximately 34 kilometers north of Afyonkarahisar in modern Turkey. 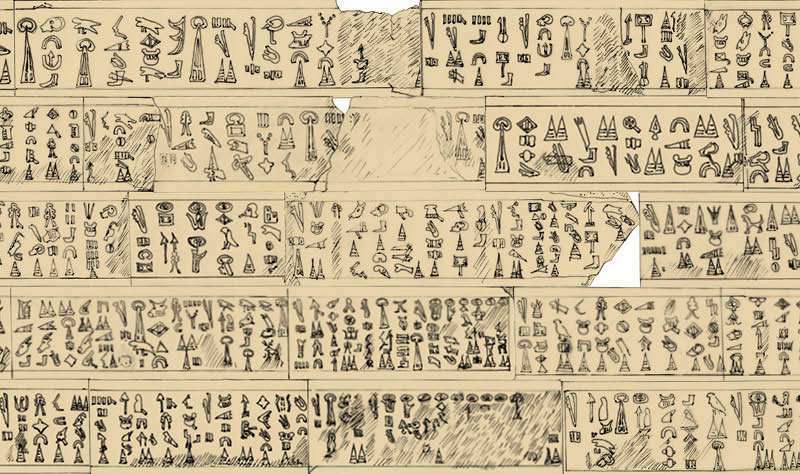 It bears the longest known hieroglyphic inscription from the Bronze Age. Soon after local peasants retrieved the stones from the ground, the French archeologist Georges Perrot was able to carefully copy the inscription. However, the villagers subsequently used the stones as building material for the foundation of their mosque. From about 1950 onwards, Luwian hieroglyphs could be read. At the time, a Turkish/US-American team of experts was established to translate this and other inscriptions that during the 19th century had made their way into the collections of the Ottoman Empire. However, the publication was delayed again and again. Ultimately, around 1985, all the researchers involved in the project had died. Copies of these inscriptions resurfaced recently in the estate of the English prehistorian James Mellaart, who died in 2012. In June 2017, Mellaart's son Alan handed over this part of the legacy to the Swiss geoarcheologist Dr. Eberhard Zangger, president of the Luwian Studies foundation, to edit and publish the material in due course. The academic publication of the inscription will appear in December 2017 in the Proceedings of the Dutch Archaeological and Historical Society – TALANTA. Among other things, Zangger and the Dutch linguist and expert in Luwian language and script, Dr. Fred Woudhuizen, will present a transcription, a translation, a detailed commentary, and the remarkable research history of the find. The inscription and a summary of its contents also appear in a book by Eberhard Zangger that is being published in Germany today: Die Luwier und der Trojanische Krieg – Eine Forschungsgeschichte. According to Zangger, the inscription was commissioned by Kupanta-Kurunta, the Great King of Mira, a Late Bronze Age state in western Asia Minor. When Kupanta-Kurunta had reinforced his realm, just before 1190 BC, he ordered his armies to storm toward the east against the vassal states of the Hittites. After successful conquests on land, the united forces of western Asia Minor also formed a fleet and invaded a number of coastal cities (whose names are given) in the south and southeast of Asia Minor, as well as in Syria and Palestine. Four great princes commanded the naval forces, among them Muksus from the Troad, the region of ancient Troy. The Luwians from western Asia Minor advanced all the way to the borders of Egypt, and even built a fortress at Ashkelon in southern Palestine. According to this inscription, the Luwians from western Asia Minor contributed decisively to the so-called Sea Peoples' invasions – and thus to the end of the Bronze Age in the eastern Mediterranean. I can think of no other reason for how a small city state can conquer the Hittites( as large as the Egyptians of the time, and competing with them), and then decide that was so easy and so much fun, that they go on a rampage to bring everyone else down . . . than that this Mira city state made iron age weaponry more practical. This will also have a huge affect on Biblical archaeology - that of who burned down the cities that the Hebrews claimed for themselves. There were some news, just some weeks ago, saying that the Sea Peoples didnt realy came from the Aegean, but from north Syria. This conclusion came after a new interpretation of an inscription that is the crucial evidence about Sea Peoples. As for their ceramic, it must have been imported from Kypros (Chypre).